This system is designed to print and apply address labels to direct mail pieces from a computer database. 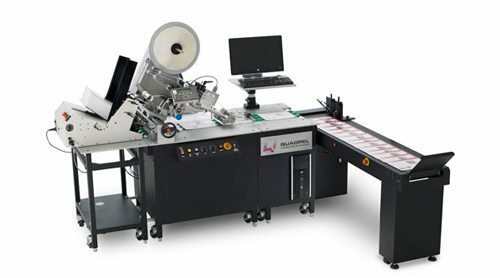 When equipped with an in feed hoper/stacker, this system is ideal for applying promotional or prime labels to a wide variety of flat media, including: cartons, pouches, CD/DVD cases, credit cards, books, etc. Also shown is an optional shingling conveyor for ease of handling of the labeled media.